The top shortlisted twenty-seven ‘spellers’ from across Kimberley, Riverton, Ritchie and Barkley West areas, participated in a regional Spelling Bee, an event that is funded as part of Droogfontein Solar Power’s literacy programme. 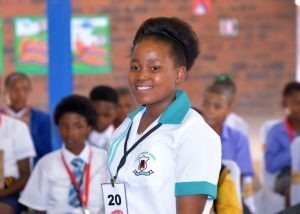 Bringing together some of the brightest learners, this is the second time that the region has hosted a Spelling Bee and this time it included Afrikaans, Setswana and isiXhosa in addition to English, making it a more inclusive competition. A spelling bee is a competition in which contestants are asked to spell a broad selection of words, usually with a varying degree of difficulty. These competitions are recognised as offering a range of benefits, from higher confidence to better vocabulary. Participants are also now provided with Nalibali reading materials to help them prepare for the event. “Spelling Bees actually test reading, not a memory, so learners should therefore prepare for these types of events by increasing their reading and understanding of how words are constructed and how letter sounds work together,” explained Hlengiwe Radebe, Economic Development Director of Droogfontein Solar Power. These types of competitions not only provide a valuable educational experience for the participating learners, but also allows them to engage in healthy competition. Other benefits derived from this fun activity include team building, improved grammar, building a competitive spirit, increased knowledge of the origin of words, developing cognitive skills including the ability to handle pressure; and most importantly, these events help to boost a child’s confidence level as they gain self-assurance through learning to speak in public. The event was supported and attended by parents, principals, teachers, friends and family as well as representatives from the Department of Education’s Intermediate Phase. Each participant was awarded with a medal and a cash prize, with the first place prize winner taking home a trophy, medal and a cash prize. This event forms part of Droogfontein Solar Power’s ongoing literacy programme that supports the Department of Education’s literacy objectives. Furthermore, the prior selection process ensures that the standard of the Spelling Bee is kept in line with national and international standards. “It is important that our learners have the opportunity to learn and compete in a supportive environment and gain skills such as improved memory and the art of presenting in public,” concluded Radebe.